Xanthoma of the prostate is a localized collection of lipid-laden histiocytes within the prostatic gland. No specific clinical findings have been reported other than an elevation in the serum level of prostate-specific antigen (PSA), which prompts the prostatic biopsy. No specific macroscopic findings have been reported, although large xanthomas may appear as yellowish foci on cut sections of the prostate gland. Prostatic xanthoma comprises collections of histiocytes with finely vacuolated, lipid-laden cytoplasm. Prostate xanthomas may mimic high-grade prostatic acinar adenocarcinoma with foamy cytoplasm, as well as adenocarcinoma with posthormonal therapy effect, particularly androgen deprivation therapy. This is especially the case when they occur in seemingly infiltrating nests, cords, or single cells on small biopsy specimens. Foamy gland carcinoma of the prostate features cells with abundant finely vacuolated cytoplasm and pyknotic hyperchromatic nuclei. While commonly occurring as a glandular proliferation, higher-grade tumors with solid sheets and single cells do occur  and can resemble xanthoma cells in small biopsies. The prostate xanthoma is usually an incidental and focal finding; in comparison, high-grade adenocarcinoma is more likely to present with extensive disease,  hence being detected in more tissue with an infiltrative pattern. Coexisting foamy and nonfoamy adenocarcinoma with glandular differentiation devoid of basal cell lining is helpful in clarifying their malignant nature. In difficult cases, immunohistochemical stains can help differentiate prostate xanthoma from cancer. 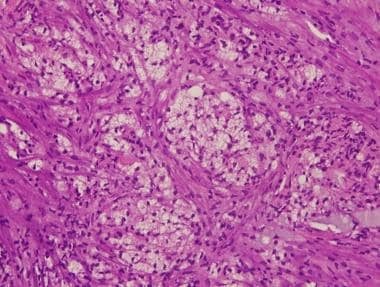 If prostate biopsies are performed following hormonal therapy for prostatic adenocarcinoma, the appearance of residual tumor cells can mimic xanthoma cells. They may show abundant clear-to-vacuolated cytoplasm with hyperchromatic nuclei without nucleolar prominence. Knowledge of preceding treatment and the finding of other therapy-related changes, such as glandular atrophy, as well as basal cell hyperplasia, should alert to this differential. Tumor cells usually retain prostatic epithelial antigenicity, and immunohistochemical stains can be used for their identification. The histiocytic nature of the cells is demonstrated by a positive result on staining with CD68. Rare cases may demonstrate reactivity of the histiocytes to prostate-specific antigen (PSA), prostate-specific acid phosphatase (PSAP), and alpha methylacyl coenzyme A racemase (AMACR), likely as a result of the presence of phagocytosed material. Prostatic xanthomas are negative for MNF116 and other cytokeratin stains, including CAM5.2. No information on the molecular and genetic features of prostatic xanthoma is currently available. Chuang AY, Epstein JI. Xanthoma of the prostate: a mimicker of high-grade prostate adenocarcinoma. Am J Surg Pathol. 2007 Aug. 31(8):1225-30. [Medline]. Sebo TJ, Bostwick DG, Farrow GM, Eble JN. prostatic xanthoma: a mimic of prostatic adenocarcinoma. Hum Pathol. 1994 Apr. 25(4):386-9. [Medline]. Non-neoplastic diseases of the prostate. Bostwick DG, Cheng L. Urologic surgical pathology. 2nd ed. Elsevier, Inc; 2008. Chap 8, pg 402. Epstein JI, Netto GJ. Epstein JI, Netto GJ. Biopsy interpretation of the prostate. 4th edition. Lippincott Williams and Wilkins; 2008. 152-3. Zhao J, Epstein JI. High-grade foamy gland prostatic adenocarcinoma on biopsy or transurethral resection: a morphologic study of 55 cases. Am J Surg Pathol. Apr 2009. 33(4):583-90. [Medline]. Bostwick DG, Cheng L. Neoplasms of the prostate. Urologic Surgical Pathology. 2nd ed. Elsevier, Inc; 2008. 511.